How do you make a red salad without adding Jello? You use strawberries. How do you make a red salad taste delicious without adding extra sugar? You use pineapple. How do you spend 10 minutes putting together a salad that is delicious and festive, but not have to actually do the work on Christmas day? 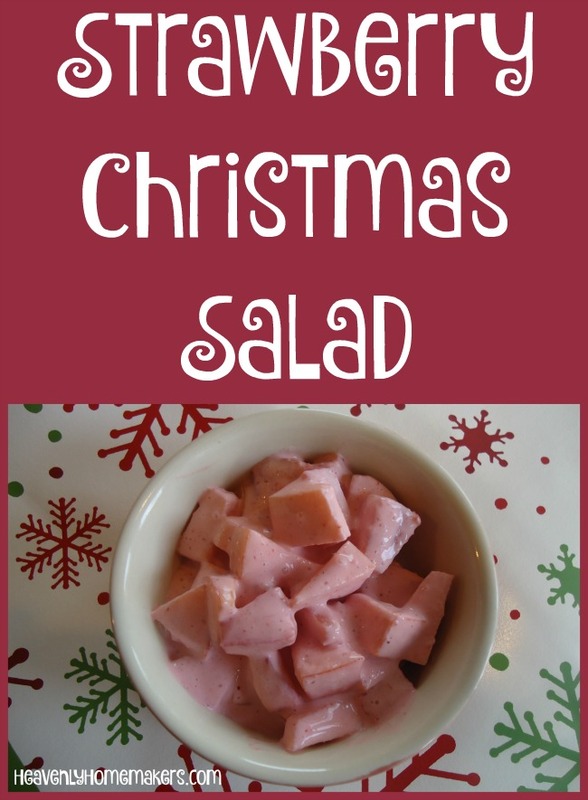 You make this Strawberry Christmas Salad the day before Christmas and store it in the fridge until serving time! No really. We’re blending the frozen strawberries with some cream – so the mushiness makes no difference and is actually beneficial for making a smoother strawberry cream sauce for this salad. Place thawed strawberries and heavy cream into a blender. Whip until smooth. Set aside. Wash apples and chop them into small pieces, putting them into a medium-sized bowl. 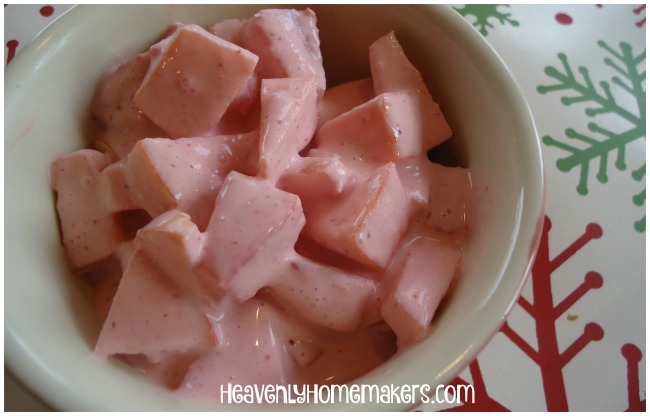 Pour strawberry cream mixture over the apples and pineapple. Stir well. Serve right away or refrigerate until serving. Make this ahead of time for convenience! Feel free to add a little honey, maple syrup, or stevia if you like. We found that this salad is sweet enough for our tastes without adding any sweetener! We’ve been loving this salad as a tasty add-on to our meals. I think we’ll make this on Christmas Eve to eat with our Christmas breakfast. Mmmm, fun Christmas-time food. I love this time of year! I love how your recipes can be made soon after you post them — because I usually have all the ingredients in the freezer or pantry! I’m going to add this to our Christmas Eve breakfast. Thanks for sharing. Tried this recipe and loved it!!! We will definitely be making this throughout the year too.